Regular air conditioning maintenance is extremely important and necessary during summer when you will be using your cooling unit for longer hours. 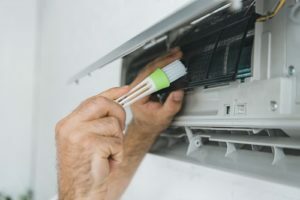 Aside from properly cleaning your indoor and outdoor units as well as changing or washing your filters, there are other important aspects of maintaining your air conditioner. Read below to find what these are. There are some things you will need to do before starting your air conditioner for the first time. It is highly recommended that you do these days before summer to ensure your air conditioner is ready to serve you in the coming warm days. Plus, should you find your unit has problems, it will be easier for you to seek professional assistance. Make sure the outdoor unit – the condensing unit – is not covered with dust and debris like leaves and branches. The unit needs to be able to draw in the air freely without any hindrances to effectively function and operate. Ensure you have clean filters. If your unit uses disposable filters, purchase additional filters as you will most likely be replacing them more often during summer as you continue to use your air cooling unit for longer hours. If it uses washable filters, make sure you wash them at least once a week. Keep in mind that air that is blown throughout your houses passes thru these filters. They need to be clean and free of clog to ensure smooth airflow. Check your thermostat Most homeowners panic when their air conditioner does not function properly when the only problem is they have not properly adjusted the thermostat settings. Make sure that your thermostat is in the right setting so as not to cause damage to your air conditioning unit. Inspect all access panels of your air conditioner. Screws may become lose even if you are not using your unit. Either way, you still need to check them to ensure they are secure and tight. Regularly remove debris that has accumulated around or near your condensing unit. Keep in mind that leaves, dust, papers and other debris are blown by the wind on a daily basis. So even if you cleaned and removed debris from your condensing unit before you use it for the summer, this debris can come back in a week or a couple of days. To ensure, your condensing unit is free of debris, clean it at least once a week. Hire a air conditioner maintenance professional to clean your unit before the summer season begins. This will ensure that your unit is properly and efficiently cleaned before and after you use it during summer. Avoid cleaning your air conditioner by using your garden hose to spray water over it. There is a proper way of cleaning your heat pump. Cleaning it with water is dangerous considering it is an electrically powered machine. You might be doing more harm to your unit than cleaning it if you used water. Keep in mind that water and electricity when combined may result in electrical shock or a short. Thus, it is highly recommended that you hire professionals to clean your air conditioning unit. These checkups are an important aspect of maintaining an air conditioning Florence as these help you discover if there are problems with your air conditioner before we are in the hot summer temperatures. They are especially helpful in identifying small potential problems so you can resolve them earlier before they lead to large, more damaging and costly problems. According to experts, you should have your air conditioner checked by trained and skilled professionals like Florence HVAC Experts at least once a year, particularly every spring. This is the best time for a checkup as it will give you sufficient time to repair and resolve any problems before the summer season when you will need your air conditioner the most. Call Florence HVAC Experts now to inquire about their air conditioner maintenance services.